In September, 1945, Ho Chi Minh announced the formation of the Democratic Republic of Vietnam. Unknown to the Vietminh Harry S. Truman, Winston Churchill, Clement Attlee and Joseph Stalin had already decided what would happen to post-war Vietnam at a summit-meeting at Potsdam. They had agreed that the country would be divided into two, the northern half under the control of the Chinese and the southern half under the British. Colonel Lansdale also recruited mercenaries from the Philippines to carry out acts of sabotage in North Vietnam. 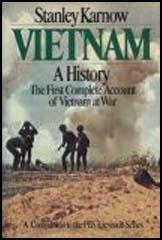 This was unsuccessful and most of the mercenaries were arrested and put on trial in Hanoi. Finally, the American advisers set about training the South Vietnamese army (ARVN) in modem fighting methods. For it was coming clear that it was only a matter of time before the anti-Diem forces would resort to open warfare. Johnson now had the excuse he had been waiting for and ignored Captain Herrick's second message. He ordered the bombing of four North Vietnamese torpedo-boat bases and an oil-storage depot that had been planned three months previously. President Johnson then went on television and told the American people that: "Repeated acts of violence against the armed forces of the United States must be met not only with alert defence, but with a positive reply. That reply is being given as I speak tonight." Peace talks between representatives from United States, South Vietnam, North Vietnam and the NLF had been taking place in Paris since January, 1969. By 1972, Nixon, like Johnson before him, had been gradually convinced that a victory in Vietnam was unobtainable. In October, 1972, the negotiators came close to agreeing to a formula to end the war. The plan was that US troops would withdraw from Vietnam in exchange for a cease-fire and the return of 566 American prisoners held in Hanoi. It was also agreed that the governments in North and South Vietnam would remain in power until new elections could be arranged to unite the whole country. The spring of 1975 saw a series of NLF victories. 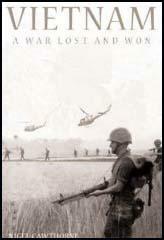 After important areas such as Danang and Hue were lost in March, panic swept through the AVRN. Senior officers, fearing what would happen after the establishment of an NLF government, abandoned their men and went into hiding. The NLF arrived in Saigon on April 30, 1975. After declaring that Vietnam was now a united country, Saigon was renamed Ho Chi Minh City. The Socialist Republic of Vietnam was established in July 1976.